The evening mist has just settled. A middle aged man wrapped in a grey shawl waits in the station. Beside him is a cup of tea, long since cold. On his right is a Gujarati newspapers loosely folded. On the paper is a big Motorola cellphone. Just about a hundred meters away a couple of house are filled with strangers. Numbering about 30, they remain in silence waiting for a call from a Motorola wireless transmitter. A couple of days ago, news came in that women and children were coming in from kar seva. On route to home, they would have to pass through a small station in rural Gujarat. The group were to take part in a small 'welcoming'. As the middle aged man looked at his watch, the station signboard glistened at the passing lights of some nearby car. It read - Godhra. Substantial preparations were already made for the party. The photographers among them were highly trained and equipped with state of the art equipment. In the dim lights of the night, the surgeons got to work. 31 men were being operated upon. The faces change was to be a surprise - last minute notice from Nagpur HQ. The photographers had previously taken pictures of some local MLAs and other leaders of the Opposition party. The doctors were craft fully replacing their faces with the Congress MLA ones. This sinister design was hatched long ago within the depths of the secret headquarters of the Aar Ess Ess. With the makeshift plastic surgeries completed, the group lay idle waiting for the last few hours for dawn to break. In the early morning of Gujarat, history was being made by the most ghastly plans ever. The place that had never seen a single riot would be witness to the world's biggest mass murder over the next 9 years. The sleepy dogs woke up in the noise. All the men came in from several directions dressed in salwars and fez caps. The man was impressed with their new look. From the saffron robes yesterday to the bearded angry men today, he calmly counted them - 31. Over the end of the station were kept 20 cans of 5litre jerry cans filled with petrol - requisitioned from a few tractors in the locality. They should come in handy, the man chuckled. After a nerve wracking few minutes, the train came into full view. As rehearsed the men blocked the railroad. The driver slowed the train and finally stopped it. It was not unusual to stop trains for showing grievances. It was then that the crew started working in perfect harmony - locking up the carriage earmarked by a railway official. The shrieks of the women and children were drowned by the roar of the murderous mob. The place was bathed in patrol and without any preparation or giving any time, it was lit. The man looked at the time on his watch. Two and a half minutes late, he gasped. Never mind, he said to himself and kept down the newspaper on the station bench. The black smoke, cries of women and children slowly gave way to the acrid smell of burnt flesh. The crew looked around for the man who guided them. They called the Motorola phone. It rang on the bench, neatly kept on the folded newspaper. Later in the morning - The canteen boy came in to deliver the breakfast to the chief minister. He had been working there for decades and had access everywhere. 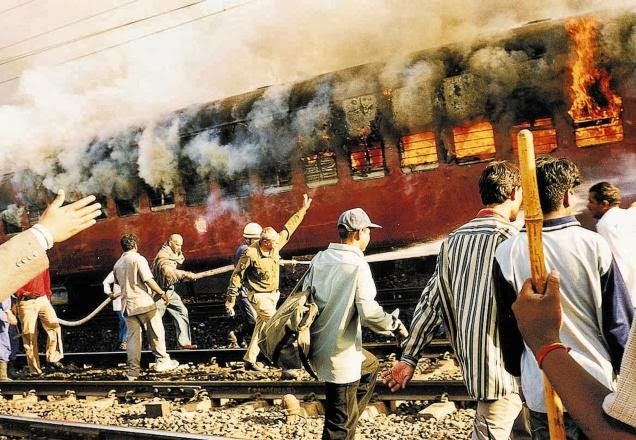 "Do you know kar sevaks were burnt in Godhra today, every one is worried and tense?" The CM sipped his tea, raised his hand, smiled a little looked at him in his eyes and said, "You forgot to bring the sandwiches". PS - This is a completely made up story. In case it escapes anyone with low intellect this is called sarcasm. Enjoy it.